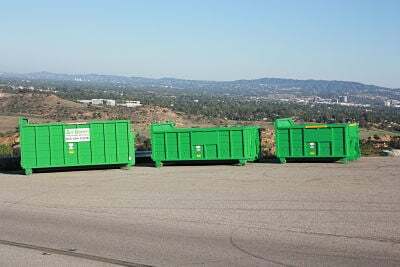 The Green Dumpster Rentals offers the best rates on trash dumpster rentals in the San Fernando Valley! Rent a bin CALL TODAY FOR A FREE QUOTE! Our 3yd dumpster is a great bin for small jobs. These containers are the same size you see behind apartments. 3yd dumpsters are for trash only (no dirt, rock, concrete, tile, sand or stucco). Wood and other lightweight construction materials are allowed. This bin is great for cleaning out a small amount of trash from your garage or side yard. Please inform us if you need your 3yd dumpster to have wheels and lids. For 3yd dumpster rental prices please find and click your city in the CITIES WE SERVICE tab above. The 9 yard smart dumpster is a great choice dumpster rental size if your looking to do a smaller size kitchen remodel, getting rid of some furniture, cleaning out the garage, side yard, etc. The smart dumpster was designed for those who don’t need or have room for a large dumpster. We had this dumpster built custom to fit inside a garage, carport,small alley, narrow street, or any other tight spot. For 9yd dumpster rental prices please find and click your city in the CITIES WE SERVICE tab above. The Green Dumpster offers a 16 cubic yard dumpster for those who need to rent a dumpster to get rid of larger sized items such as mattresses, long sofas, large tree trimmings, garage clean outs, medium sized kitchen remodels,etc. The 16yd dumpster can fit in a somewhat empty garage or carport with easy straight access. For 16yd dumpster rental prices please find and click your city in the CITIES WE SERVICE tab above. The Green Dumpster offers a large 25 cubic yard dumpster for larger projects including home renovations, large clean outs, foreclosure estate clean outs, demo work, larger sized garage (2 or more cars),etc. For 25yd dumpster rental prices please find and click your city in the CITIES WE SERVICE tab above. The Green Dumpster offers a large 40 cubic yard dumpster for larger projects including home renovations, large clean outs, foreclosure estate clean outs, demo work, larger sized garage (2 or more car),etc. For 40yd dumpster rental prices please find and click your city in the CITIES WE SERVICE tab above. The Green Dumpster offers a 10 cubic yard dumpster for projects including concrete, dirt, brick and rock. For 10yd dumpster rental prices please find and click your city in the CITIES WE SERVICE tab above.